Wayne Jacob’s Smokehouse is one of my favorite places to visit when I’m in the New Orleans area. Located about an hour northwest of the city in the town of LaPlace, in the cultural center of Cajun Country, the restaurant and smokehouse produces artisan quality charcuterie, including traditional Cajun Andouille Sausage and Tasso Ham, Smoked Sausage, Beef Jerky and Ham Hocks. 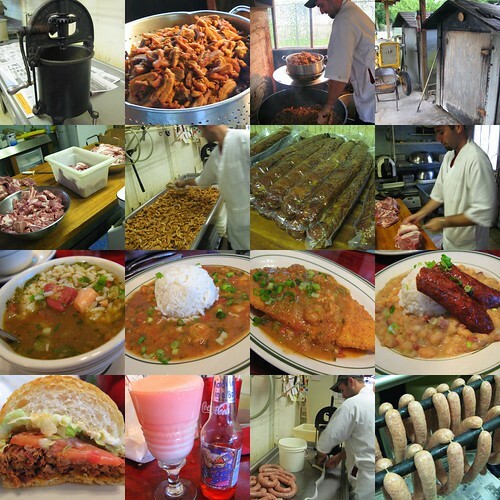 Their pork cracklin’s are also the best I’ve ever had, and many of their smokehouse products are featured in their restaurant items, including their very good gumbos, Po Boys and traditional dishes. Click on the collage above for a complete slideshow in hi-res. This entry was posted on Monday, September 3rd, 2007 at 12:55 pm and is filed under Food, General, New Orleans, Podcast. You can follow any responses to this entry through the RSS 2.0 feed. You can leave a response, or trackback from your own site.